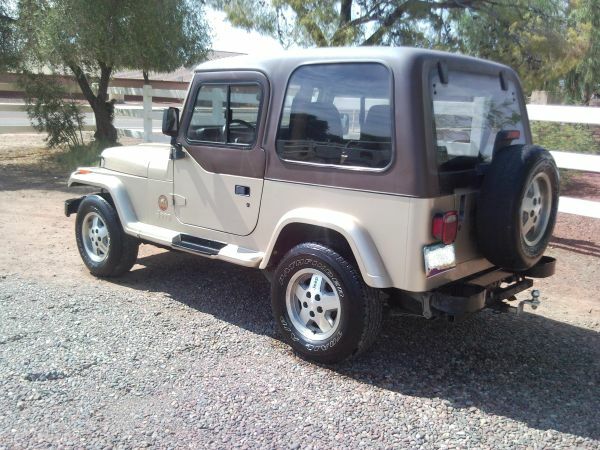 My build began with the purchase of a 1993 Wrangler Sahara on August 18th. She had 129,000 miles on her, and was purchased from Arizona. She looked, and the previous owner had described her to be pretty much exactly what I was looking for. I was mislead… And buying a car long distance leaves you little recourse in such a case…. Here is what she looked like then. You’ll notice she has half doors, but a hard top. The previous owner no longer had any of the soft top hardware, but she was originally a soft top, as she has original half doors. The hard top is an aftermarket “rally top” which are $2000 to purchase. The Previous Owner promised me she would make it to Denver. I Didn’t even make it from Phoenix to Flagstaff before she broke down. She was loosing power on hills, and dying on me. UGH. Thank goodness I have AAA. After towing her to Flagstaff and doing repairs, the rest of the trip went easy. But once I got her home, she still was not passing emissions… So after a trip to my local mechanic, and more $$$. she is now 95% mechanically sound. She is still leaking from the rear main seal, which is a time consuming repair, but one I can do myself, and as long as I watch the oil level it won’t strand me. If I had gone to see the jeep in person before buying I might not have bought this particular one… The seats had much bigger issues than the owner disclosed to me, and front end has been repaired, though the frame is straight, thank goodness, and the respray (in original color) was cheap and poorly done. But when you fly out to get a long distance car, you kind of kill your options. I did further negotiate down the price, but not enough really to offset the additional costs and especially not enough to deal with the extra mechanical issues it had. That puts a dent in my paint budget….